At ten o’clock on Sunday morning, the twenty-second of October, 1882, in an abandoned house in the West Bottom of Kansas City, just a stone’s throw from the stockyards, a fellow named Jasper Harrison did not wake up. His inability to do was the result of his having had his throat cut sometime during the previous night. At the same time, in the same location, in the very same house, another fellow, by the name of Eddie Kepler did wake up. Now, it is trying enough to wake up on a Sunday morning after getting drunk on Saturday night in a saloon on the other side of the state line. However, it is downright disconcerting to wake up beside a dead man, who is staring at you with hollow eyes and a very ugly scarlet gash across his throat. Therefore, Eddie staggered out into the blinding daylight and started hollering very loudly for the police. I know these things because by noon on that same day, I was kneeling down on the floor beside my new partner, the Reverend Mister Ezekiel Amos Black, and together we were examining the body of Mr. Jasper Harrison. 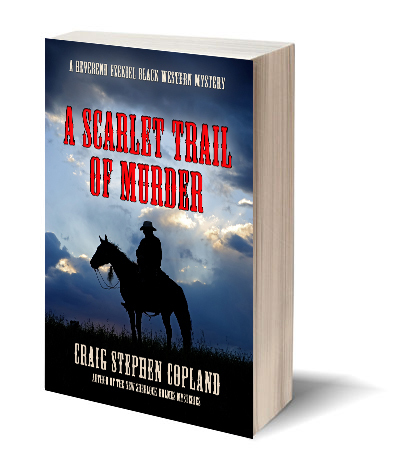 Three weeks and nearly three thousand miles later, the Rev, as I have become accustomed to calling the Reverend Mister Black, had not only brought the murderer to justice but had helped solve several other murders and some very nasty deeds that stretched back over fifteen years. This story of mine, which is appropriate reading for all members of your family, about the brainiest and downright strangest preacher and part-time Deputy US Marshal, is going to tell you how that all came about. And I am not going to be at all surprised if, after reading it, you will agree with me that Reverend Ezekiel Black was certainly one very smart man but, my goodness, was he a strange bird. I think of him as the Sherlock Holmes of the American West. You should buy this book now and enjoy the mystery.